The International Women's Forum - New Mexico (IWF-NM) was founded in 1989 in Santa Fe. The vision of our founders was to provide opportunities for women leaders in a variety of professionals throughout the state to network with their peers and counterparts, and to meet and collaborate with other active female professionals on business, social, cultural and personal issues. Our primary goal is building leadership skills and fostering opportunities to lead and for friendship among our members and for future generations of women in our state. IWF-NM members come together from diverse backgrounds and interests to share knowledge and ideas, to enrich each other's lives, and to provide a backdrop of support and exert influence. Our members represent an exciting and wide range of professional pursuits — directing Fortune 500 companies, composing symphonies, conducting medical research, founding new businesses, managing ranches, leading cities, hosting radio shows or running TV stations. We serve on the highest judicial courts, preside over universities, promote peace, direct non-profits, author books and record or make history. Our group is proudly affiliated with the International Women's Forum (IWF) and we support the common mission of advancing women's leadership across careers, cultures and continents. The IWF has 64 chapters in 23 nations, on five continents. The International Women's Forum - New Mexico participates in worldwide IWF meetings from Hong Kong to Vancouver to Madrid, Jordan and Buenos Aires. We also enjoy travel and learning opportunities in the United States as well, joining other chapters from Miami to Chicago to Pittsburgh to Seattle. IWF-NM sponsors noteworthy community service efforts designed to offer opportunities to women in need of social, financial, emotional assistance — or all of the above. The LEAP Program makes grants to worthy non-profit groups that help New Mexico women. A major IWF-NM initiative, the Historic Women's Highway Marker Program, memorializes women of importance throughout the state's history with sixty-four roadside markers to tell their stories. The program offers permanent recognition to these New Mexico women of courage, vision and fortitude throughout New Mexico's history. 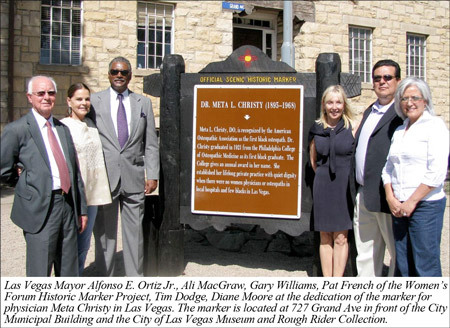 For more information visit the New Mexico Historic Preservation Division website. ©2009-2019 International Women's Forum - New Mexico. All rights reserved.